The other day I posted what our criteria were in a house and how we’d probably never find one house that had everything so we should just settle for something close enough. Well I was wrong. We could in fact find 1 house that had everything. And we found that house on Friday. We had literally almost given up the search and put in a bid on our “85% house”. This was a house that had nearly everything we wanted, but not quite. It was missing about 15%. But I have kept a close eye on the listings for months now and know every house out there in our price range and this seemed to be all there was. We talked it over and something was telling us to wait. Even though we were under some deadlines, because our current house was closing in 6 weeks, it just didn’t feel right. So I said I would do another search, looking only for new listings and see if anything came up. This was our last ditch effort. 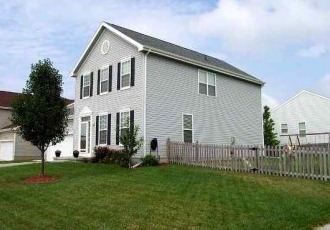 Well 2 houses did come up that fit our criteria and price range. So we had our realtor set up the showings for Friday over lunch. When I saw the listings online, something told me one of them would be “the one.” Thursday night before drifting off to sleep I prayed that God would lead us to the right house. The one that had everything we wanted and would be our dream home. The first house we saw on Friday wasn’t it. It was a nice house but smaller than we had hoped for and only 3 bedrooms upstairs. The basement was also pretty tiny. CJ liked it a lot but I wanted to wait and see the next one. When we pulled in to the driveway, I knew. It was elegant and traditional, while also having a modern flair. I love the colors. It also seemed very homey. I can totally picture it with a big wreath on the front door and Christmas candles in the windows. And, it had a huge yard on a corner lot. With a fence! It seemed pretty perfect just from the outside but I reserved excitement. I didn’t want to jump the gun. For all I knew, we could walk inside and hate it. But we didn’t. It had everything on our list. It was the first house that we didn’t have to give up one thing in order to get something else. Check, check and check! The only item in the list of 17 things above that it doesn’t have is a 3-car garage. BUT it does have a pretty roomy 2-car garage with shelving and storage built in so we’re set there. Let’s walk through some of the highlights and features that we fell in love with. I love the cherry cabinets and solid surface “stone” countertops. 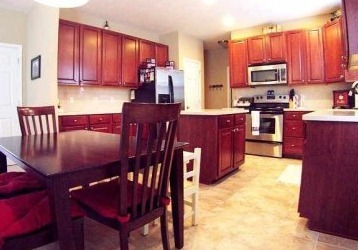 There are a ton of cabinets and counter space too. All new stainless steel appliances (which, yes, I know will show fingerprints but gees, they’re just so pretty), tile flooring, large pantry and space for a table. LOVE! The laundry room and main floor bathroom are just behind the kitchen in the little hallway you see in the back corner. That’s also where you come in from the garage. The rest of the main floor is the dining room, living room (or is it family room? I can never remember which is the more formal one and which is the one you use) and family room. I love that the fireplace has a unique carving around it and that there is plenty of room for lots of seating. 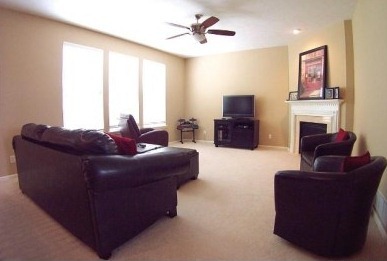 Another bonus: it’s NOT a sunken family room (or is it living room?). I know that sounds odd but we looked at several houses with sunken family rooms and that one little step going down seemed to trip up Isabella and me. Literally. She fell down it in one house and I fell down the step in another. It was really quite embarrassing. I was talking away to the agent and the next thing I know I’m falling forward. Ha Ha, oops. So anyway, a house without that means less risk of injury for us clumsy Traders. There is enough space in this room for our bed, dressers, etc. 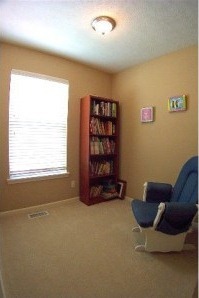 AND a cozy chair and lamp in the corner for a little reading nook! The first door on the far left of the pic is the walk-in closet. The open door toward the center is the bathroom. No, the walls aren’t really curved. The listing agent shot these pics with a fish-eye lens to make the rooms look bigger but he didn’t need to because they are pretty big as they are. Anyway, double sinks, whirlpool tub and shower. CJ and I can actually share a bathroom now! That will be really weird at first…but I think I’ll love it. There are 3 other bedrooms up there, which are all HUGE! The other cool thing is that this house has a little loft at the end of the hall. It’s really just some extra space after the stairway but they call it a loft so I will too. We thought this might be a good spot for Samson’s bed kennel. Or maybe a reading nook, like they have it. We’ll see. 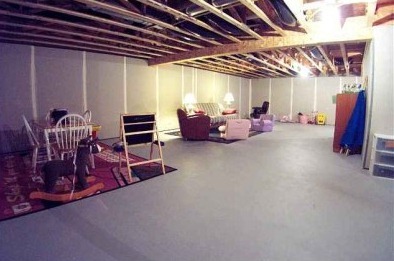 It also has a HUGE basement. This picture just shows one side of it. The other side has a bunch of shelves for storage. Obviously it’s unfinished but the drywall is done which is huge. As you can see, it’s usable right now and could serve its purpose as my workout room quite nicely. We will probably finish it off at some point in the future but there’s no rush. We only needed the one showing to know this was “the house”. So we talked with our agent about the best offer to make and he set out putting the papers together. We got it all wrapped up and signed by 5:30 that night and the offer was submitted. Now it was just waiting. Around 10:30 pm that night we got a call from our agent that they had come back with a counter offer. They hadn’t budged much from their asking price and we wanted a better deal. So we thought about it and then offered up our own counter the next morning. They came back 2 hours later with another counter that was only $1000 above our previous offer so we took it. Done and done! Of course we still have to get through the inspections and other stuff but for all intents and purposes, we are sailing toward home (pun intended). And the best part of the deal – they can be out on the date we need them to be so that we don’t have to find temporary housing in between. Phew!! We are so excited! This is truly our dream house and something we NEVER thought we’d find. I guess it goes to show you should never give up or lose hope. There’s just might be something waiting for you around the corner! 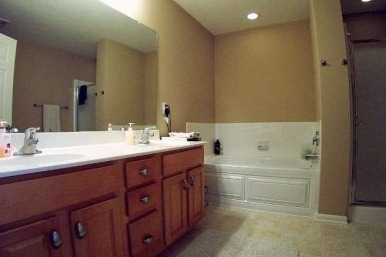 *Note: all photos were taken from the online listing of the house, courtesy of CBS Home real estate. Obviously none of the furniture or décor is ours. Pack ‘em Up, Move ‘em out! 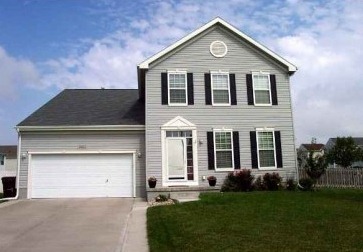 *Note: all photos were taken from the online listing of the house, courtesy of NP Dodge. Obviously none of the furniture is ours. First of all, great plugin, nice job.I have one qsiuteon. On my check-out page i want to give the customers the opportunity to change the quantity of their products. Is there a possibilty that if i show the [cfshoppingcart_cart 1] on the same page as the form, the quantity will change in both the [cfshoppingcart_cart 1] and the textarea in the form?Thanks in advance.